This is a very simple card to put together. The original idea came from my friend Jan Wakeland. 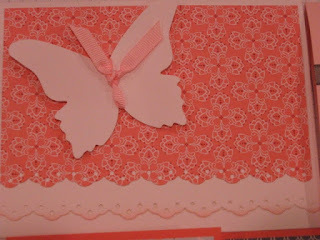 Once again I used my Big Shot Die Cutting Machine to cut out the butterfly using the Beautiful Butterfly's Die. The designer paper is from Raspberry Tart collection. I used the Eyelet Border Punch along the edge of the designer paper and the front edge of the Whisper White card base. A little sponging on the edge adds depth. I tied a piece of Pretty In Pink 1/4" grosgrain ribbon around the butterfly to look like antennas. Simple, yet so pretty! Accessories - Big Shot Die Cutting Machine, Pretty In Pink 1/4" grosgrain ribbon, Eyelet Border Punch, Stampin' sponge (for applying the ink along the edge of the card). Take advantage of the Buy 3 get 1 FREE Designer Series Paper sale! Only a few days left. Most of these papers will be retired soon so don't miss out on this great deal and a chance to collect our beautiful designer papers! This includes the Walk in The Park paper in the Occasions Mini Catalog as well.